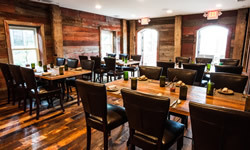 The Stables at Husk is a private dining and events space located in our historic carriage house, and offers the opportunity for a customized and exclusive Husk experience. The Stables exists separately from the main restaurant with its own kitchen, restrooms and patio, providing an intimate setting. The Obelisk room at Husk Greenville is a private dining and events space that provides the opportunity for a customized and exclusive Husk experience. Paying homage to the mural that adorns the interior restaurant wall, the room can seat up to 24. 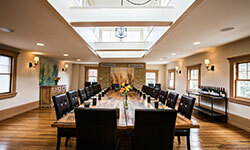 Guests also have the option of renting out the top floor of the restaurant, which can comfortably accommodate 70 guests. 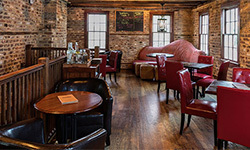 Husk Savannah offers two private dining and events spaces that provide the opportunity for customized and exclusive Husk experiences. 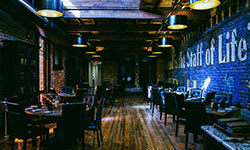 The Independent Room occupies the third floor of the restaurant, and can seat 24 for dinner and 36 for a reception. 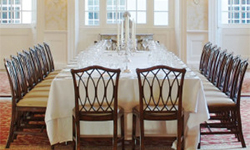 The Oglethorpe room occupies the second floor of the restaurant and provides space to accommodate up to 12 guests with Handicap Access.